Non-members are welcome to come along to any of our winter meetings; just turn up and introduce yourself. The Village Hall in Whiddon Down is on the road exiting the A30 in the direction of Moretonhampstead. The Village Hall is next to the Post Inn pub and there is a good-sized car-park. Okehampton branch doesn't have its own apiary so our summer meetings are held at members apiaries. One advantage of this is that meetings are held all over our area so there should be a meeting nearby to all members at some time during the summer. 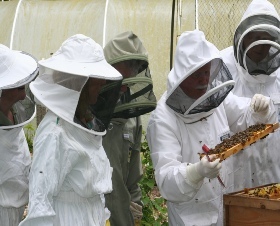 Another advantage is that we get to see different styles of beekeeping in action. Saturday May 4th. A visit to Paul and Fi Reddaway’s Apiary. Set in beautiful gardens, which at certain times of the year are open under the national garden scheme. 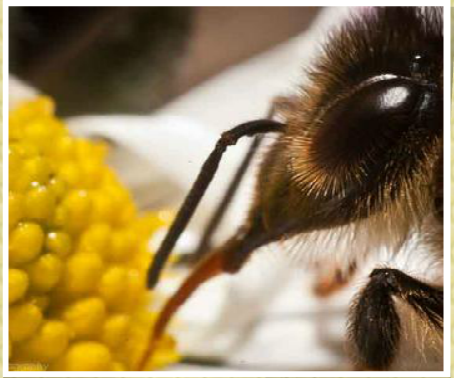 This is a visit for plants as well as bee fans. Bring and share tea. Come along and visit the Bee tent, put your name down to help with the Okehampton branch display, all members very welcome all help appreciated and don’t forget to put in an entry. Sunday June 9th. Bee Safari. Back by popular demand. Martin Hann seasonal Bee Inspector has agreed to come and join us to go through colonies in the Bow area. Please let Simon or Margaret know if you have bees in Bow or the area and would be happy for us to pay a visit. More details to follow closer to the day. Saturday July 6th. Apiary visit to Marian Minton. Taw Mill, Wembworthy EX18 7SW. Always a guarantee to learn something new when Marian talks bees, this will be an interesting and informative meeting with a very experienced beekeeper. Bring and share tea. Come along to the Okehampton Show, join us in The Branch Bee Tent, all help gratefully received. Talk bees to the visitors to the tent. Please support the show by putting in an entry. There is a class for everyone. Saturday August 24th. Visit to Quantock Division Apiary. We are going out of County for this one. Set just outside Bridgwater. The Quantock Apiary is a very interesting place for a bee visit, hives to go through, education centre and last year over four acres of wild flower bee/pollinator meadows were sown. I know this trip is outside our usual stomping ground but I feel it is worth the trip. We will organise car sharing. Saturday September 7th Apiary visit to Will Pyne. Tawleigh. Oaktree Park, Sticklepath. EX20 2NB. The last visit of the Summer. What better way to prepare our bees for Winter than a trip to a very experienced Beekeeper to see how he plans for the season ahead.